I make no apology for sheer geekiness of this post – it just bubbled up from some deep nerd chasm within my psyche! Nostromo is the name of the space craft from Ridley Scott’s original Alien movie. I’ve been fascinated by every aspect of this movie since before it opened in 1979 and the production design made a huge impression on me when my obsession was art and design in every single form. The ship itself is one of the major stars of the movie along with the incredible Alien itself designed, of course, by HR Giger. Alien was one of the first movies to portray space travel not as the clinical and precise vision we’d seen elsewhere but grungy and grim, worn at the edges and industrial. Ron Cobb was the principal production designer for the spaceships and he did an incredible job at creating the vision for a space tug boat that hauls huge payloads around the galaxy whilst the crews sleeps. 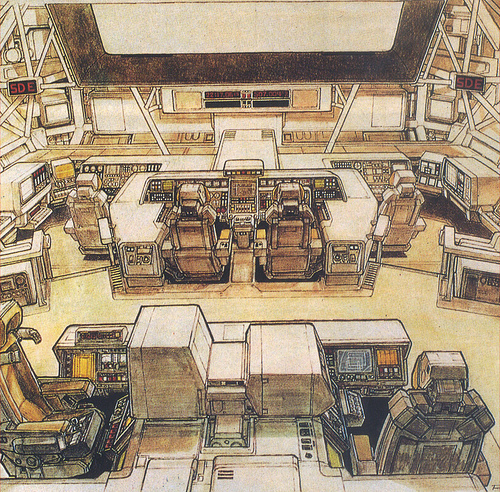 Cobb designed both interior and exterior in exquisite detail using traditional methods (it actually looks like he used magic marker on most of his production drawings) and these informed the visual identity of the spaceship that actually appeared in the final movie. 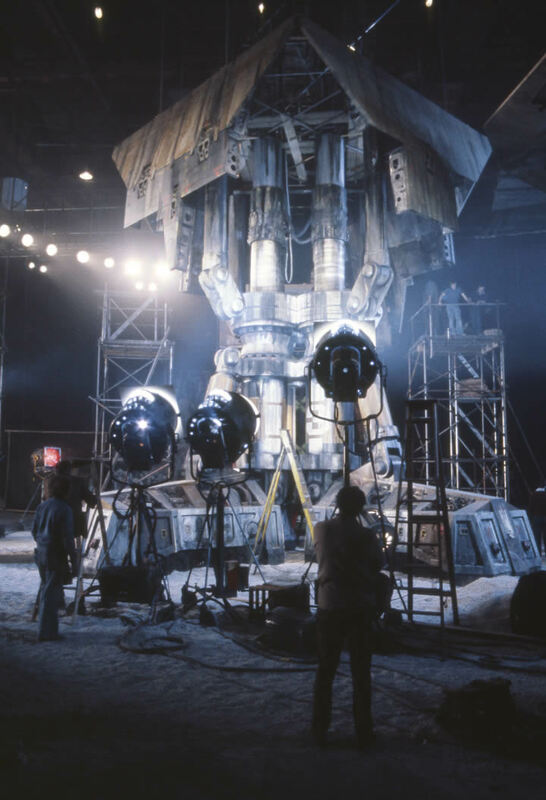 The movie was made in a time when a lot of the effects were physical ones and the spaceships were actually built in ‘miniature’ sizes and shot although these miniatures were actually quite large. 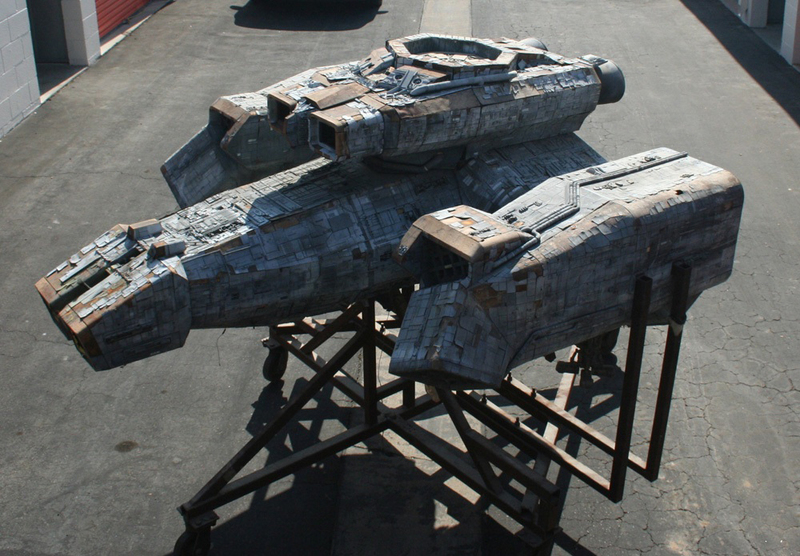 The Nostromo model was about six feet long and weighed around 500 pounds. These miniatures were lovingly crafted bt model makers who cannibalised model kits to create the detail on the ship – apparently their favourite kits used or ‘bashed’ on Nostromo were a WW2 Sherman tank and Darth Vaders’s TIE fighter. What amazes me is that they actually built a full size landing gear leg for Nostromo – it must have appeared on film for all of five minutes in the final movie. Ridley Scott was a notorious stickler for detail and accuracy and I’ve no doubt that he’s behind the beautiful attention to detail that pervades this entire movie from the opening credits right through to the final nail biting minutes. It’s easy to see why CGI is a used these days – the sheer cost and time involved in creating old school effects must be an impossibility in this day and age. I do have to say when you watch a movie that’s put together with craft, passion and love it’s visible a mile off. I absolutely love this, it appeals to my inner geek on so many levels. I remember so well how this really inspired your art and design at the time, you were quite prolific in your output of enthused drawings. Pingback: Sika’s 100 Greatest Movies of All Time! 11. Alien (1979) « Lunki and Sika – Movie, TV, Celebrity and Entertainment News. And Other Silliness. I swoon for this movie! Nerds to the end! You’ve written a very good essay! Please write back!